Summit Hosting Review 2019: Is Summit Hosting a Good Hosting? Established in 2016, Summit Hosting has been growing steadily as a cloud hosting vendor in the United States and Canada. The company is a Quickbooks cloud hosting vendor and a Sage managed hosting solutions vendor. Summit Hosting is a U.S. cloud hosting provider. It was founded in 2016 by Stanley Kania as an amalgamation of NovelAspect.com and myownASP.com. It provides dedicated servers for every one of their clients, and in just over two years has grown tremendously to have more than 15000 users in the U.S and Canada. Summit Hosting is a Sage managed hosting solutions vendor. Summit Hosting offers several hosting solutions including Sage cloud hosting, Quickbooks cloud hosting, application hosting directory, and dedicated servers. They do not offer shared hosting solutions, preferring instead to provide cloud hosting and dedicated servers. As a Sage-accredited vendor, Summit Hosting offers Sage services including fixed asset hosting, Sage HRMS hosting, and Sage CRM hosting. They are also an Intuit Certified Hosting Partner (which means QuickBooks). This vendor ensures foolproof security through dual user authentication and a unique password protection policy that require users to update their passwords once every 90 days. In addition, their encryption uses extended validation (EV) to ensure the highest possible protection. So far so good, except I did not find details of any physical security measures at their data centers. Summit Hosting has a standard disaster prevention and recovery policy comprising daily backups (retained for 15 days) and a full recovery service. Backups can be retained for longer than 15 days if required, and unlike many hosting companies, they do not charge to restore data. I found Summit Hosting’s pricing to be pretty standard compared to other cloud hosting providers in the United States. While they offer a free trial period for some of their hosting plans, this is not provided by default, so you have to ask. Otherwise, there is no money-back guarantee, but they do boast an impressive 99.9999% uptime backed by a compensation plan. The Sage X3 plan includes three months of free hosting if you commit to a three-year contract. For technical support, Summit Hosting has a toll-free phone number and a ticketing system that you can use 24/7/365. It typically takes only 20 minutes to receive a response after opening a ticket. The polite and patient technical support staff treat customers with utmost respect, but unfortunately, do not provide support by email or live chat. The online knowledge base includes video tutorials, and their FAQ section addresses a good number of the likely queries from webmasters. onClick="trackClickout('event', 'clickout', 'Vendor Page - Visit User Reviews', 'Summit Hosting', this, true);"
Summit hosting refuses to allow you to speak to a support representative without at least 3 failed attempts at resolving the issue via email. The miscommunications and delays in resolutions simply were unacceptable for our company. We canceled service due to lack of customer support. Summit Hosting is a perfect vendor for businesses looking for Intuit QuickBooks or Sage cloud hosting. For a company that has only been around for just over two years, their 15,000+ customers are a testament to the quality of the services they offer. 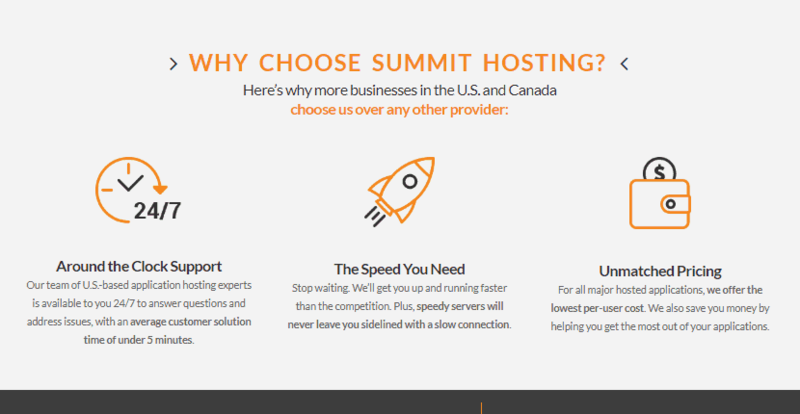 Wondering how Summit Hosting stacks up against other Web Hosting companies? Enter any other Web Hosting company and we will give you a side-by-side comparison.